Happy Thanksgiving to your and yours! We hope you have a lovely safe holiday. The store will be closed Thursday, November 26 and Friday, November 27 so that we can enjoy the holiday with our family. Online orders will be shipped on Wednesday the 25, and again on Monday the 30th, when we resume normal shipping schedules. What a FUN workshop! 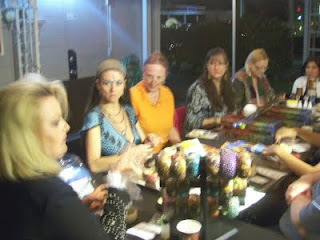 A HUGE thank you to Brenda for hosting this great demo/class on her Create-Your-Own Bajidoo Bangle kits. The end results were FANTASTIC! Yes! We will have another, but we will structure it differently. It will be more like a henna class where you will have to RSVP for a seat. 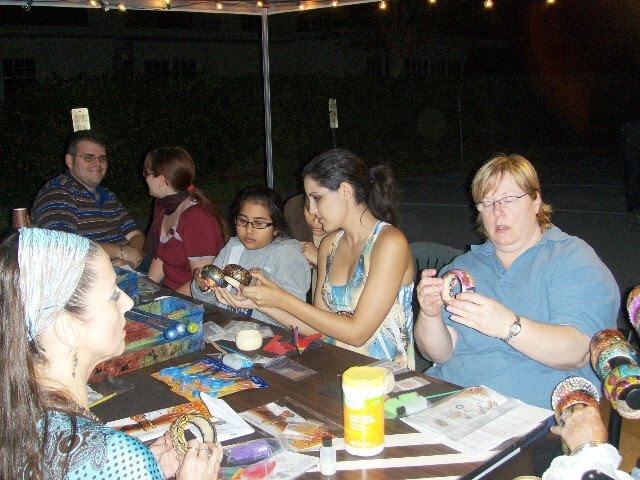 Instead of working form a specific kit, all the art and decoration will be a la carte to give you more flexibility! If you want to be notified of the class, sign up for our email list and CHECK the local Events box. Woo Hoo! We've gotten started! Celia's final bangle using Urban Goth art. 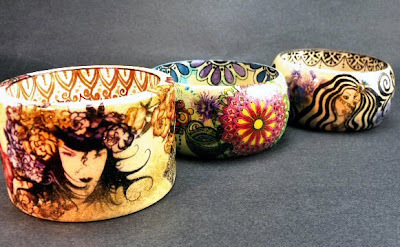 Nadia and Samantha's final bangles. Flower power with Henna Fusion! WOW! What a GREAT Saturday! 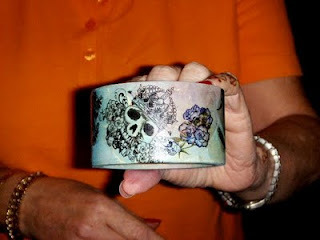 The workshop lead by Brenda for the DIY bangle kits was positively awesome! It was the first one so we learned much to make the next one even better! More pictures will be posted tomorrow. Florida Tribal Dance is always a treat to watch! Silver Sage, the student troop preformed. It's tough to believe they are students, because they are AWESOME! If you have not taken Lacey's classes, you really need to give it a try. 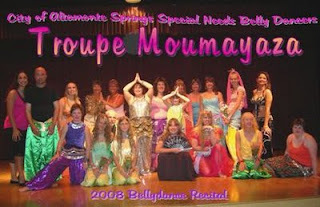 Check out her website for class times and find a beginning dance class that fits in your schedule. Try just one class and you will be hooked! All ages, styles, body-types, and experience are welcome. Don't want to go alone? Bring a friend or shoot me an email. I'll be happy to go to a beginning class with you! 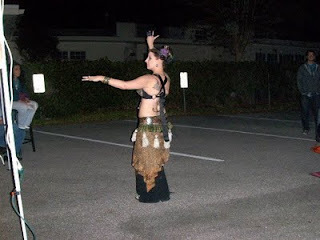 Laura performed a solo after the Silver Sage performance. She is incredible! The control! The technique! The stage presence! Whenever I see Laura perform it reminds me of what fantastic performers they are for parties. Hire them for a holiday party and your guests won't stop talking about it until you have them back again! Mary and Tammy of Yip Podcast performed some improve tribal style and pulled out some new moves I hadn't seen before! Super cool! Nina and Erika joined them for a second dance. Around 9:00 thing started winding down as people pulled up a blanket and folding chair to enjoy a free screening of Tamalyn Dallal's documentary "40 Days 1001 Nights". Sposored by Yip Podcast, Mary got permission form Tamalyn to show her film. It's a peek into everyday life in the Islamic world and it's really a must see. A HUGE thank you to everyone that made this event such a success! I hope to make these events a regular occurrence! Stay tuned for details on the next one! Don't forget about "Go Green for the Holidays" this Thursday! We are thrilled to participate in this year's annual "Go Green" Holiday Shopping Event in College Park! As always, we have some special surprises for you! Support local businesses, meet new friends (and brings some you already have), and have some pre-holiday fun! To RSVP, call 407.999.5251 or email info@artistreeco-op.com! Go to our events page for other event information. One of our very favorite shops has completely re-modeled, added new products, and is have a Grand Re-Opening this Thursday! The re-opening will be at Sanford's monthly Alive After Five event (on the 2nd Thursday every month) this Thursday (after 5 of course!). 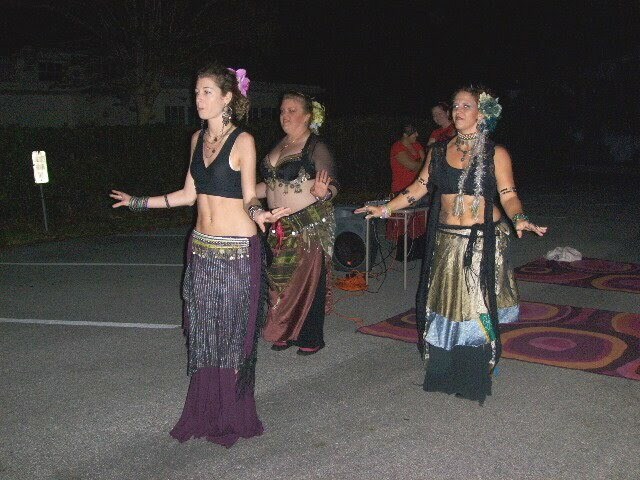 Divine Mother Earth is where I get those gorgeous flowing skirts you see me wear in the shop. 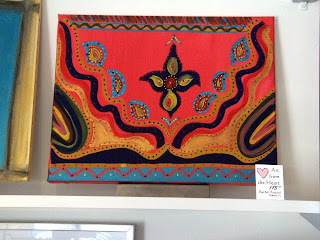 Rhada, the owner, has a wonderful eye for buying. 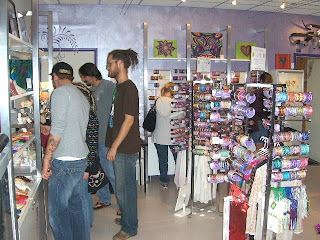 You will find organic teas and herbs, fabulous clothing, Tibetan artifacts, ethnic jewelry, and so much more! It's going to be a party so put it on your list and stop by! We'll be there! For The November 2nd Saturdays On the Drive we have a feast of fun for you! 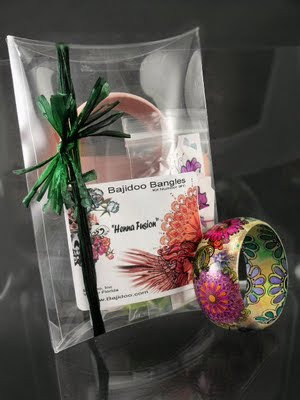 7:00 FREE Create-Your-Own Bajidoo Bangle Workshop! Brenda of Bajidoo bangles has found a way to allow us regular folk to create gorgeous handmade bangles using original Bajidoo art! 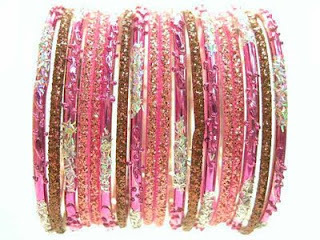 The above bangles are the finished product YOU will create! REALLY! The workshop/demo is free and if you want to follow along, you can purchase a kit for only $19.99. 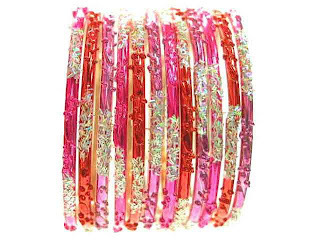 I have 12 seats available if you wish to actually create a bangle with Brenda. Email me to RSVP as soon as possible and I'll reserve a seat for you. This alone is worth a trip to the event! Silver Sage will be performing for your pleasure. 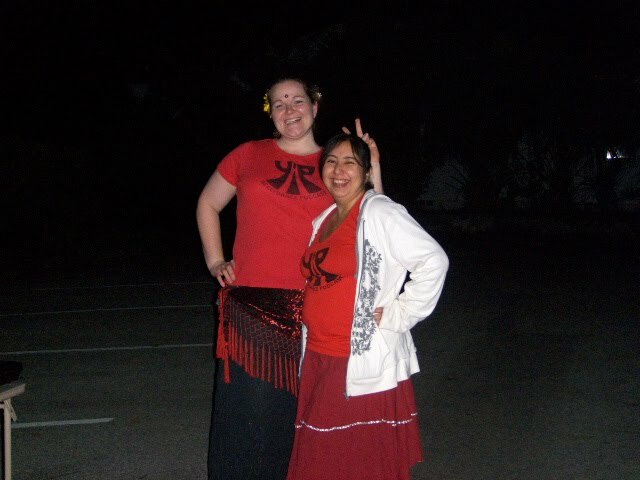 Consider hiring Florida Tribal Dance for your holiday or New Years party. Laura will be there to answer your questions about what they offer. Bring a blanket or folding chairs, a snack, and settle in for a screening of the musical documentary, 40 Days 1001 Nights, One Woman's Dance Through Life in the Islamic World. 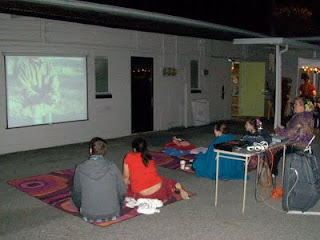 We'll show the film on a screen in our back lot and offer discussions and thoughts with each other. Mary and Tammy of Yip Podcast will be our organizers and hosts for the evening! 2nd Saturdays is a monthly event put on by local College Park Businesses. For more information see www.OnTheDrive.org. Henna 101: An in depth introduction to the basics of henna tattoos. Everything you need to be comfortable and confident doing henna. 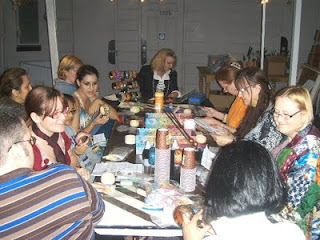 A hands on "how to" henna class for henna beginners to intermediate henna artists. Taught by Jody of Beachcombers Bazaar. The only thing you need to bring is yourself and a smile. A comprehensive henna kit is provided. Feel free to bring henna you already have if you have questions about it. 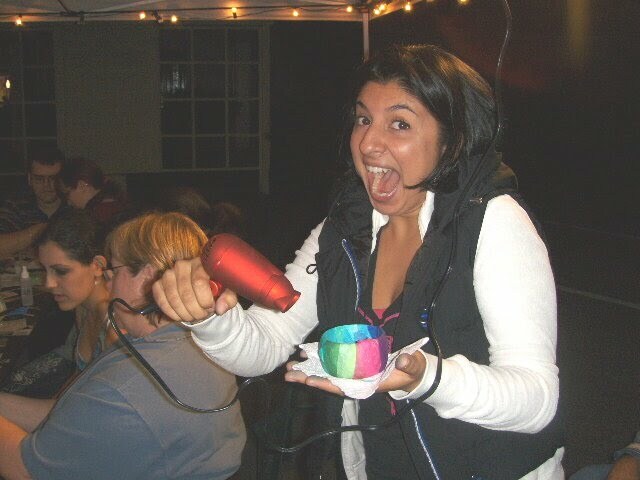 Cost includes workshop and complete henna workshop kit (no substitutions for kit products). Additional product will be available for purchase after the workshop at discounted prices. Payment must be made before the workshop by Visa, MasterCard or cash. Space is limited! Only 10 seats available. This workshop will sell out, so don't delay (6 seats have already sold). Sorry no coupons or discounts are accepted for workshop registrations. No refunds due to limited seating. Your invoice is your ticket, so remember to print your invoice. An invoice ticket will be emailed to you. Receipt ticket will be provided. I can't wait for this 2nd Saturday On the Drive! Guess what's going to be here? The Seminole Community College Planetarium! They will have a solar telescope to look at the sun and a solar system simulator! I admit it. I'm a science geek and can't wait to run over to their exhibit. The planetarium exhibit will be set up in the French Nest courtyard (who will be serving wine and cheese!). find out what else is going on for the September 2nd Saturday at www.OnTheDrive.org. We have fun stuff going on as well! We are also going to have fun stuff going on! We will have the ever popular community drum circle and tribal dancers from Florida Tribal Dance! Anyone can join in the drumming and dancing, so this is a great opportunity to see if tribal dancing is right for you. Lacey, the director of Florida Tribal Dance is around to answer questions. Of course, we will have our henna tent set up beside the store! Susan will be here with her FULL selection of Eyegasms Mineral Pigments along with testers. She is an expert at matching up colors with skin tones. 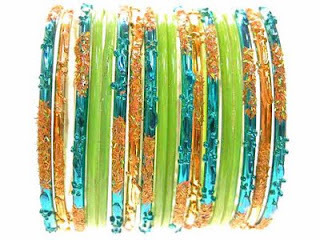 Buy 4 bangle sets, get the 5th set FREE! Buy 3 Indian tunics and get $5 off EACH shirt! PLUS all of our anniversary specials! September is going to be a great month for 2nd Saturday! Stop out to join us! Woo Hoo! 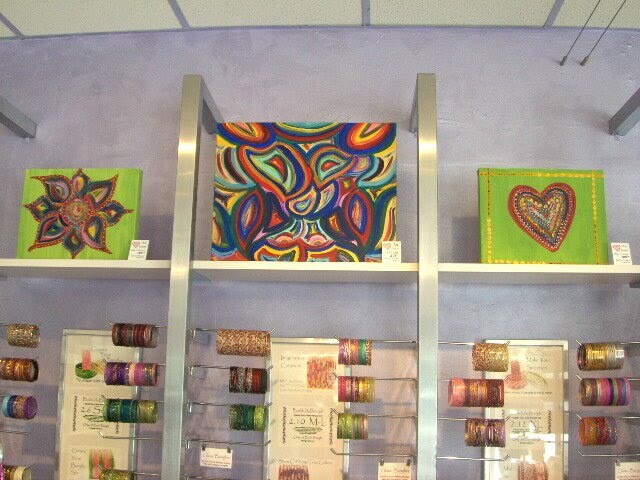 September is our 1 year anniversary for our store, Beachcombers Bazaar, in College Park Orlando. 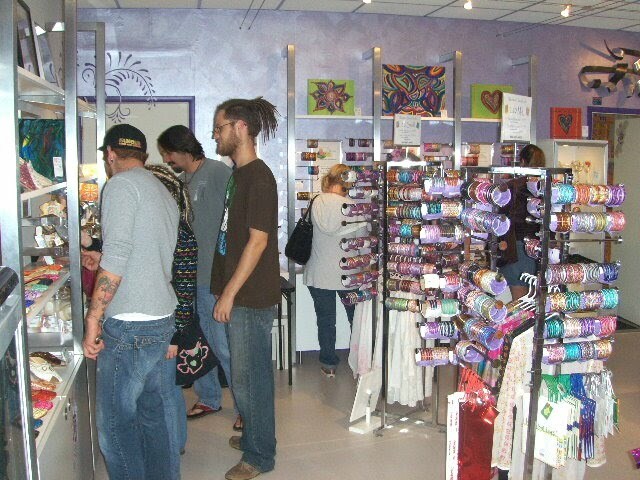 We have been a full time online business since 2004 (5 years) and now a retail shop since 2008 (1 year). Pretty cool yes? This is an accomplishment that we are proud of, and we want to celebrate with you all month! 5 Years = 5% OFF all purchases over $25! 30% off Journals and Cards! Free henna tattoo with any purchase $50 or more! September's 2nd Saturday On the Drive will be the best yet, including a planetarium exhibit! Be sure to join in our community drum circle with the tribal dancers! Henna applicator bottles are normally the easiest way to apply henna, especially for someone new, because they are very natural to use. We offer a fantastic selection of soft squeeze bottles and applicator tips that are interchangeable. We have our soft squeeze bottles specially made for us, so they are extra soft and can be used with either Moroccan tips or Jaq tips (both tips require a coupler to work with the bottles). We offer one ounce bottles and half ounce bottles. This is the bottle size I suggest for people new to henna. These are what is generally used for henna application. They need to be refilled more often, but they are easier to work with and create less waste. These are nice if you need to do quite a bit of henna. You'll save time with fewer refills, but you will have more waste and need to use more henna to keep it filled. Now that you know about the bottle sizes, you need to select the applicator tips to use with your soft squeeze bottles. These are the most common applicator tips and are offered in three fine to medium sizes, .05mm, .07mm, and .09mm. Jaq tips are stainless steel and require a nip to work with our soft squeeze applicator bottles. Many henna artists started off using these tips and will use nothing else. They are a classic option that does the job very well. These are a bit newer, and aren't seen as often, but they are AWESOME! I like to think of these as the next generation to the Jaq bottles. They used to be paired with squeeze bottles that were harder plastic than the Jaq bottles, but now we've had special syringe caps made that work with the softest squeeze bottles available. If you are currently using Jaq bottles, our syringe caps and Moroccan tips will work with them! We offer Moroccan tips in standard plastic/stainless steel tips and also a polished stainless steel variety that is exclusive to us. Moroccan tips require a syringe cap to work with our soft squeeze bottles. The standard Moroccan tips (plastic) are offered in five sizes from fine to large, gauges 19, 18, 17, 16 & 14. The stainless steel Moroccan tips are offered in five sizes from super fine to large, gauges 20, 19, 18, 16 & 14. These are the tips I suggest for anyone looking to do henna for more than a few of times. The stainless steel tips are polished on the inside of the tips as well. 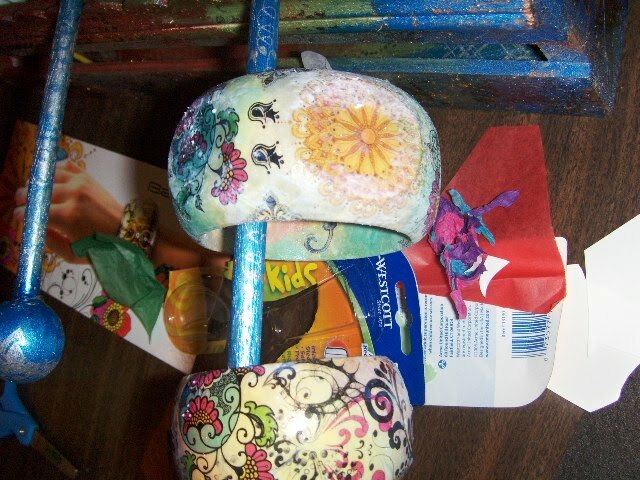 This allows the henna to flow beautifully. I can't think of any cons regarding the polished stainless steel tips! If you are unsure you can always try one of our combo applicator kits that contain multiple tips that can be used with the same bottles. Personally I either use a mylar cone to apply henna or the Moroccan Stainless Steel tip applicator bottles. Henna is a wonderful thing! It can be anything you need it to be... healing, spiritual, relaxing, an energy generator, or just plain fun! Most people are familiar with henna in one of two ways, henna as a part of Indian weddings or henna tattoos at festivals. Henna can be both of those things and so much more. 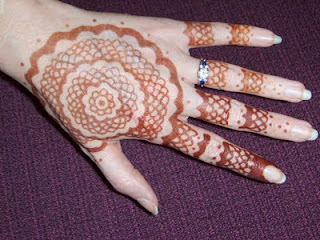 Wedding henna is typically done by a professional henna artist hired by the groom's family. The bride will often get her henna done the day before the mehndi party and at the party will have gilding paste (to match her outfit) applied to the henna while guests are getting henna done. Sometimes there will be one henna artist for the bride and one for the rest of the guests. 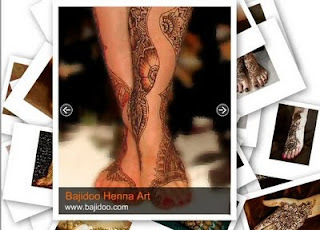 Wedding henna is typically traditional freehand henna designs and goes from fingers to elbow and toes to knees. The grooms name is hidden in the henna for him to find on the wedding night (wink wink). Things don't bode well for a man that doesn't find his name in his bride's henna! Festival henna is often fun and quick. Normally, there will be a selection of henna designs for you to choose from with a pre-marked price. The henna artist will typically make any modifications to the design that you would like. Hopefully you have found a festival henna artist that freehands henna instead of using transfer paper to trace designs. There is often a line and the henna artist must work quickly, but it's a great way to get a fun henna tattoo! Aside from these henna experiences, henna can be done one-on-one or with a henna artist hired for a private party. I like to share our fantastic Orlando henna artist community with everyone whenever I can, but I also love to do henna myself. When I do henna here at the shop, I like to use the energy within you and your personality to create a custom henna design just for you. Henna helps with the energy flow within your body and I want to direct those energies in a positive way to connect you with your henna. If you need empowerment, or healing, or balance, or whatever, I want to help you find it. You should feel wonderful when you have henna on! If you start feeling bad or negative when you are wearing henna, look at your henna tattoo or touch it. Reconnect with your henna and allow that feel-good energy to flow! For me, this is what henna is about. It's not just a cool temporary tattoo, henna is powerful! No matter how you get henna done, enjoy it!